I’m a few weeks into the new job now and am learning a lot very quickly about the health insurance industry, a field I have not yet worked in before. While my career has been a bit eclectic – especially working contract jobs the past three years or so – I’m very proud of the experience and confidence I’ve gained, along with a thicker skin and some street smarts. As a contract worker, you are constantly the new kid and under scrutiny, and expected to add value immediately from Day One. I’ve probably written about this in other posts, but it’s such a fundamental part of what shapes my outlook on life. I am absolutely fascinated with the differences between work cultures – what denotes being productive, what the unwritten rules are, slowly discovering the politics, developing rapport and relationships quickly…and learning who the decision makers are as well as the influencers. Perhaps I should have been a sociologist! One thing that stands out about my current work culture is a focus on being healthy and openly talking about it. I suppose that shouldn’t be a surprise! The internal employee website has a blog and forum to discuss what people are doing to stay fit. The cafeteria is EXCELLENT and also includes nutritional info and Weight Watchers Points for everything on the menu. I hear chitter chatter in our IT department about plans to staff up the call center in case we have a major outbreak of H1N1 this winter. Hand sanitizer dispensers are everywhere, and the building is clean, clean clean. Wow. The restroom is just as clean at the end of the day as it was in the morning (someone cleans it midday), and the cafeteria tables aren’t a mess after the peak crowd comes through around noon. Being a true Taurus…well, I love food. I love cooking, eating out and could talk about food all day! So it was a huge relief to discover the cafeteria has great choices (and is subsidized – bonus!). Many of us park in a satellite lot and take a shuttle onto the main campus, so getting out midday for lunch isn’t super convenient. I am looking forward to getting off campus and exploring places to eat around town…however, this is a nice corporate campus smack in the middle of strip malls and casinos. I’m sure there’s a great hole in the wall sushi place or two. As I sprinkled a bunch of edamame over my salad from the salad bar, I thought more about eating and the choices I’ve made. I’ll admit when I wasn’t working this summer I probably didn’t eat as healthy as I should (and didn’t eat out very much to watch my wallet). Making a salad at home for one seemed kind of silly to me, so I’d occasionally cut up some vine-ripened tomatoes and make a Caprese salad with some fresh mozzarella, olive oil, balsamic vinegar and a sprinkle of Celtic sea salt. Or, maybe a handful of baby carrots. Or, maybe no veggies at all. Hmmm. I think our bodies tell us what they need nutritionally if we really pay attention and listen. Last month I constantly craved tomatoes and ate at least one a day for a week, hence those Caprese salads. I guess there was some nutrient in the tomatoes I was unconsciously lacking. 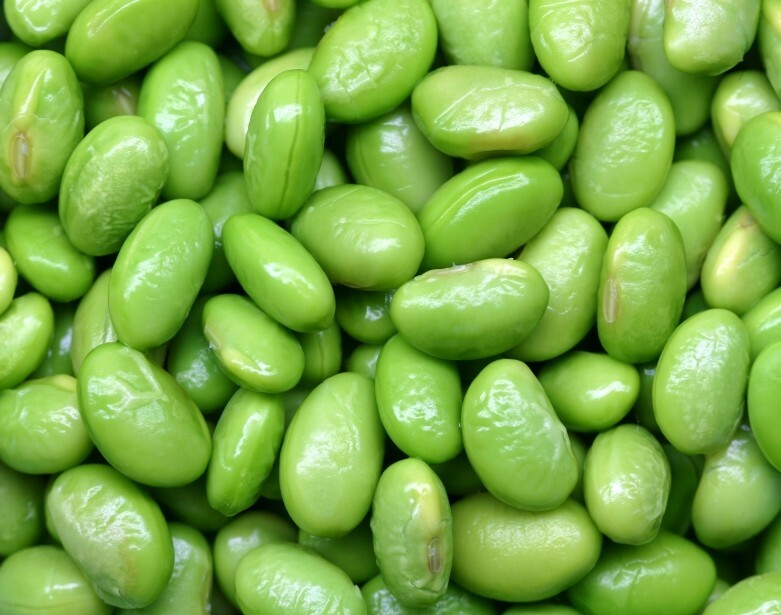 I enjoy edamame on my salads now at lunch and after reading about their health benefits that’s a habit I can keep. One day I scooped up a little of what I thought was diced chicken covered in spices but turned out – nope – it was Tofu. Not my first choice but it won’t kill me to try new things. And on Friday for lunch I had an absolutely amazing shrimp ceviche tostada with fresh salsa! OK, I’ll admit it. I have an extremely nasty Diet Coke habit. Hell, everyone needs a vice or two, right? I don’t even want to think about how many thousands of cans I’ve consumed, especially in years working in environments where sodas and juices were complimentary. I used to joke that if anyone was mapping out soda consumption at a company and wondered why it would suddenly spike up somewhere for a couple years and then drastically drop off, well, I might have been the culprit! And yes, I’m sitting here typing nursing a can of…Diet Coke. I really, truly am trying to cut back, and it’s easier now during the workweek. First of all, it’s not free, so I can calculate how much money would go down the drain at the vending machine. Now that I’m getting up earlier for the commute I’m discovering coffee again, but am trying to limit that to Friday mornings as a special TGIF treat. Isn’t coffee healthier anyway, given it’s natural vs. a can of soda chock full of chemicals? I’m fighting the Diet Coke urges during the week with good old fashioned water. I now have an environmentally correct stainless steel half liter bottle and fill it up throughout the day at work. A friend suggested taking a Vitamin D supplement, especially through the fall and winter, so I’ve started doing that as well. I guess I never put two and two together, but we’re likely to be severely deficient in it here in the Pacific Northwest given our cloudy skies and short summer season. So, I now add that to my morning routine. I hear it’s supposed to help with seasonal mood swings too. Thankfully I am used to our grey, dreary weather so that doesn’t get me down. Weight gain. This is yet again a problem, and I don’t recognize myself in recent pictures. Sure, I’ve played hockey for a few years and trained to run a couple of 5Ks this summer for the first time but I don’t feel I have anything to show for it. I lost 35 lbs a few years ago and sadly most of it has returned. In part of my effort to de-clutter the townhouse I finally gave away a lot of the clothes I simply can’t wear anymore. And dang they looked tiny when I held them up. Did I really used to fit into those jeans? The early 40s are playing a cruel joke on me, as the weight not only came back but came back in places it never used to…my waist, upper hips and tummy. GAH!! I’m terrified about looking “middle aged.” And no one ever told me at this age I’d be “blessed” both with occasional zits – still – AND a few wrinkles too. So I am hoping healthier eating choices plus stepping up the exercise will get me back to a more comfortable weight. And perhaps the work environment will be some of the influence and support I need. I tend to pooh pooh a lot of hype about crystals and their healing properties, but I’m not doubting what I felt holding that celestite. I later read that it’s supposed to help with communications, clarity of mind and replaces pain with loving light. It’s now on my desk at work…after all, it couldn’t hurt.